Description: Train 48-actually, 48/448 here, the Boston section will split at Albany-makes its stop at Utica with a pair of GEs in charge. Description: Amtrak train #6; the California Zephyr, departing eastbound. Description: Amtrak train #6; the California Zephyr, makes a quick stop in Mendota to pick up passengers. Description: Amtrak P42 98 leads the westbound Empire builder into Wisconsin Dells. Description: Second in command on the Silver Star. Title: Parked over at the downtown station, Amtrak 98 sits idling. Description: The "Chief" stops long enough for a night shot. The train to the right is the "Ann Rutledge". Description: The "Pennsylvanian" arrives at Altoona. Description: Meeting just east of CP "Alto" by the Amtrak platform. Description: The eastbound Pennsylvanian crossing Sherman's Creek. Description: The westbound Pennsylvanian kicks up the dust at 2:57PM. Title: P42's #98 & #19 are stopped in the station for refueling. 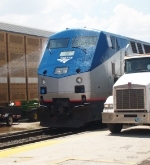 Title: Amtrak #98 getting washed w/out soap!!! Title: #98 getting a hose down.